Quality roofing adds tremendously to your home or building’s overall ‘curb-appeal’. Your roof is one of the first things to be noticed- alongside colour and architectural design. When it comes time to choosing roofing material, some important things to consider are: type of material, style, colour and cost. From natural materials like slate and wood to manmade products such as asphalt, sheet metal, and plastic polymers; there are more types and styles of roofing to choose from today than ever before. Among them are roofing materials that are impacting the environment in a friendlier way. These include being ENERGY STAR rated or material containing recycled content. Below are some of the most popular roofing materials. The key factors like cost, life span and level of sustainability are looked at so you can choose the right roof for your home. METAL TILES/SHEETING - may be composed of steel, aluminum, copper, or zinc alloy. 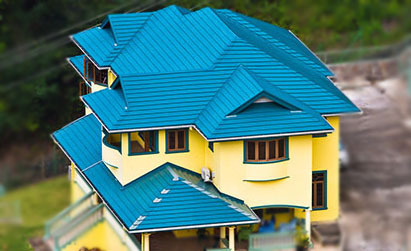 Steel roofs come with either a zinc coating or painted finish. This roofing offers high insulation solar reflectance, and durability, often lasting twice as long as wood or asphalt. They generally have a cooler temperature. Aside from its longevity, metal roofing is much lighter than most materials and very resistant to adverse weather. Metal is lightweight and fairly inexpensive. They are quite eco-friendly as they rely heavily on recycled material. They also absorb a third less heat than asphalt. They can also last up to 50 years. CLAY TILES – are made from natural clay which is fired in a kiln. While brittle and heavy, clay tiles can last a long time and are very fire resistant. They are also long lasting and require low maintenance; but being brittle by nature, they are prone to breakage. They are heavy and need reinforced roof framing to support. Clay tiles are made from natural materials but require significant energy to manufacture. They are also costly to install. Clay roofing tiles can come in lighter colours, which adhere to the cool roof standards and can reflect well over 50% of the sun's solar energy. They carry a lifespan of 50+ years. CONCRETE TILES – are made from a mixture of cement and sand. They can be made to resemble traditional clay tiles, wood shakes, or slate. Colour can be throughout tile or only applied on the surface. Concrete roofing tiles offer elegant, enduring aesthetics for your home’s design and added value. Concrete tiles are very versatile and provide greater protection to the homeowner. These flexible tiles come in so many different hues, shapes, textures and styles. Like clay, concrete tiles are heavy and need reinforced framing. They carry moderate ‘eco-friendliness’ as they are made from natural materials but require significant energy to manufacture. They are less costly than clay tiles. WOOD SHINGLES – are commonly made of cedar, but can also be made of other rot resistant woods, such as redwood. They also come in southern pine and other woods. Cedar is the most expensive. Wood shingles are cut by a machine. They have low fire resistance unless they are treated. They have a short to medium lifespan (about 30 years) and require regular maintenance. Wood shingles are made from natural material but because of their treatments they are not very eco-friendly. ASPHALT SHINGLES – are made of either an organic paper fibre mat (better for cold weather and wind resistance) or fiberglass (more fire and moisture resistant) infused with asphalt and coated with mineral granules. Standard asphalt shingles come in a variety of colours. They carry longevity options (they can last from 15-30 years), and are relatively cheap to install. They can be used on fairly low to steeper sloped roofs. They are moderate in weight and durable. However, because they are a petroleum based product their ‘eco-friendliness’ is very low. To find the above listed roof types on thebuildingsource.com click here. where can i find that blue roof in the picture? Hiring an Architect can save you money and your sanity!